SINGAPORE - A union overseeing the interests of seafaring officers will contribute $1.2 million over two years to encourage local shipping companies to provide training opportunities to seafaring cadets. Companies will receive $5,000 from the Singapore Maritime Officers' Union (SMOU) for each Singaporean cadet they take on under the Tripartite Nautical Training Award and Tripartite Engineering Training Award programmes. The two programmes train Singaporeans to be nautical deck officers and marine engineers onboard commercial ships. 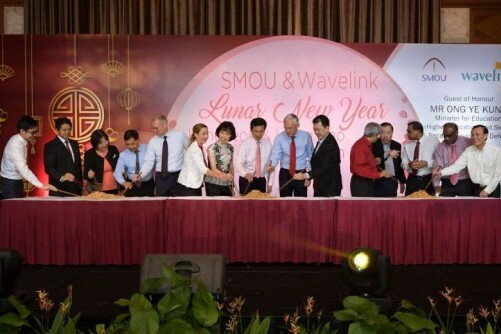 Education Minister (Higher Education and Skills) Ong Ye Kung, who announced the initiative on Thursday (Feb 2) at the union's annual Chinese New Year luncheon, said SMOU's injection comes as the shipping economic situation faces strong headwinds. "2016 has been a very challenging year for many in the maritime industry," he said. But it is during such trying times that companies should invest in human capital to develop a strong Singapore core in the industry, he added. In all, 240 Singaporean seafaring cadets under the two programmes are expected to benefit from SMOU's contribution. Both training initiatives rely heavily on industry support, as companies need to accept the trainees and place them on their ships, pay their training allowances, and offer them full-time jobs on graduation. Companies, however, receive subsidies for course fees and training allowances from SMOU, the labour movement's Employment and Employability Institute, as well as the former Singapore Workforce Development Agency (WDA), now reconstituted as Workforce Singapore. Cadets are required to pay one-tenth of the course fees, on top of receiving a monthly training allowance of up to $1,400. The $5,000 companies will receive for each cadet they accept is on top of the existing subsidies given to them. The two programmes have to date trained close to 300 cadets, spread across 20 shipping firms. With the reconstitution of WDA, SkillsFuture Singapore - a new statutory board formed last year - will continue to support the development of skills in the maritime workforce.